The classic tropical style of this dresser will evoke a feeling of tropical honeymoons and beach side resorts, and is a handy piece of furniture packed full of storage. 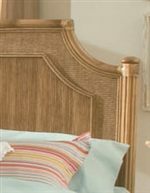 The quaint beachy look of this dresser is created by its textured rattan edges, decorative wicker paneling, bracket feet, and round carved drawer knobs. 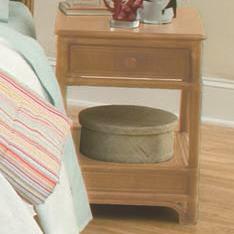 This dresser is the perfect substitute for a closet, or a useful alternative storage option. Outfitted with an incredible twelve drawers, all of your clothes, accessories, lingerie, and linens will be easy to organize and store. 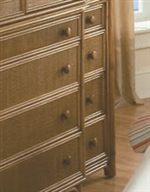 The top half of the dresser features two large cabinet doors which are good for storing thick blankets and extra pillows, and two smaller cabinet drawers good for storing stacked shoes or socks. The Summer Retreat Tropical Twelve Drawer Dresser with Four Doors by Braxton Culler at Hudson's Furniture in the Tampa, St Petersburg, Orlando, Ormond Beach & Sarasota Florida area. Product availability may vary. Contact us for the most current availability on this product. The Summer Retreat collection is a great option if you are looking for Tropical Coastal furniture in the Tampa, St Petersburg, Orlando, Ormond Beach & Sarasota Florida area. Browse other items in the Summer Retreat collection from Hudson's Furniture in the Tampa, St Petersburg, Orlando, Ormond Beach & Sarasota Florida area.